Chapter 10 of the Berlin Municipal Code pertains to the proper Display of Building Unit Numbers. 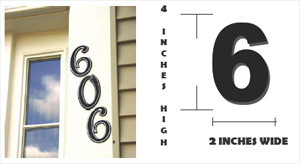 Home & Business owners must display the building unit number so it is visible from the street to which it relates. Building unit numbers can be no less than four inches in height and two inches in width, and must be a contrasting color to that of the structure to which it is attached; provided, however, that a digit for the numeral "one" shall not be subject to the stated width requirement. To learn more about the regulations pertaining to the Display of Building Unit Numbers click on the link below to view the entire ordinance.